Eighteenth-century French chamber music by members of Juilliard415, students of the Juilliard Historical Performance program, directed by Robert Mealy. Since its founding in 2009, Juilliard415, the school’s principal period-instrument ensemble, has made significant contributions to musical life in New York and beyond, bringing major figures in the field of early music to lead performances of both rare and canonical works of the 17th and 18th centuries. The many distinguished guests who have led Juilliard415 include Harry Bicket, William Christie, the late Christopher Hogwood, Monica Huggett, Ton Koopman, Nicholas McGegan, Lars Ulrik Mortensen, Jordi Savall, and Masaaki Suzuki. Juilliard415 tours extensively in the U.S. and abroad, with notable appearances at the Boston Early Music Festival, Leipzig Bachfest, and Utrecht Early Music Festival (where Juilliard was the first-ever conservatory in residence). With its frequent musical collaborator, the Yale Institute of Sacred Music, the ensemble has played throughout Italy, Japan, Southeast Asia, the U.K. and, most recently, India. 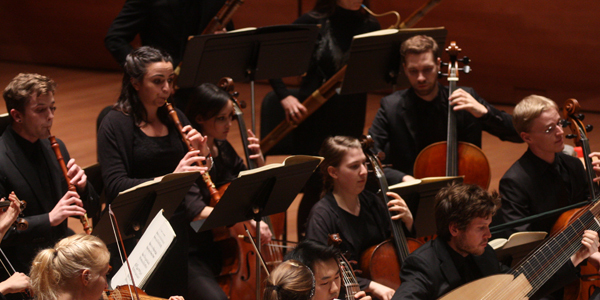 Juilliard415 has performed major oratorios and fully staged Baroque operas every year since its founding. Recent performances include Handel’s Agrippina and Radamisto, Bach’s Matthew and John Passions, Cavalli’s La Calisto, Charpentier’s Actéon with William Christie, and performances in the U.S. and Holland of Bach’s Mass in B Minor conducted by Ton Koopman (a collaboration with the Royal Conservatoire of The Hague). The ensemble’s most recent international engagement was a 10-concert tour throughout New Zealand with Bach specialist Masaaki Suzuki. The 2017-18 season is notable for the Juilliard debuts of the rising conductor Jonathan Cohen and the Belgian vocal ensemble Vox Luminis, a side-by-side collaboration with Philharmonia Baroque in San Francisco, as well as return visits by Rachel Podger in a program of Telemann, William Christie leading Monteverdi’s Il ballo delle ingrate, a concert of music from Handel’s London under the direction of Robert Mealy, an all-Bach concert for the 500th anniversary of the Reformation with Maestro Suzuki, and the rare opportunity to see a fully-staged production of Rameau’s Hippolyte et Aricie, with Stephen Stubbs conducting.